In irradiated cells, a protein complex assembles around a ring-shaped protein known as Ku, which quickly encircles the ends of DNA breaks. The protein ballet ends with the joining of the breaks ends together. Researchers studied the first phase of this choreography, with Ku at the centre, and particularly how come on stage APLF and XLF, two proteins that work with Ku. 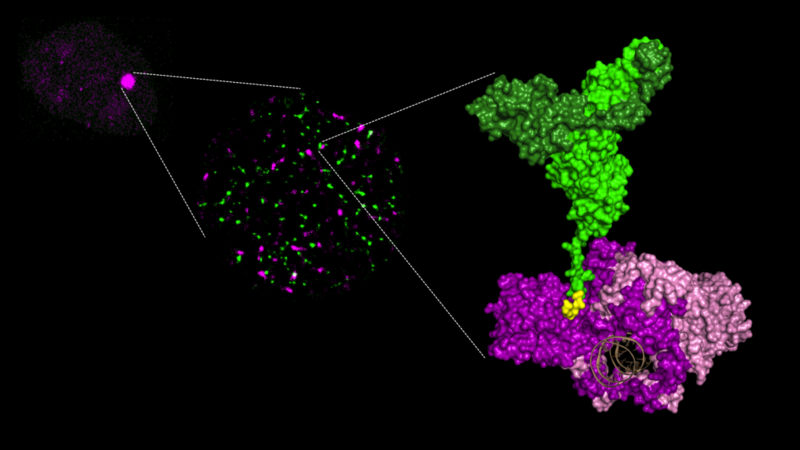 Using X-ray crystallography to view the protein complexes at an atomic scale, they produced snapshots of Ku/APLF and Ku/XLF interactions. For the first time, these images show that each of the two partners comes into contact with Ku on distinct sites. Researchers showed that if these sites are changed, breaks are no longer properly repaired and the cells survive much less after they are irradiated. Figure 1: Three levels of analysis of the recruitment of repair proteins on DNA breaks (Ku in purple and XLF in green. APLF is not shown for clarity). 3/ molecular complex characterized by X-ray crystallography: the interaction area between Ku and XLF is shown in yellow; the DNA in brown is surrounded by the Ku ring. In the long term, precise knowledge of the contact points between the DNA break repair catalysts could lead to the design of molecules that would perfectly fit to these sites, prevent the assembly of the repair machinery in tumours and potentiate radiotherapy.